While many of the jobs we work on feature a skylight or translucent wall system, we’ve seen an increase in projects where both are utilized to make the most of natural light – and with great success. 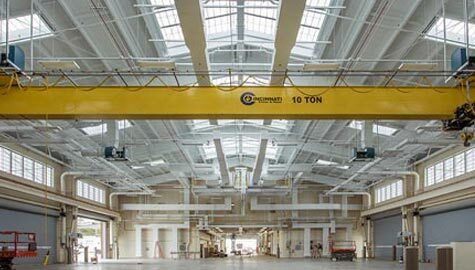 One of these projects – a Tactical Equipment Maintenance Facility (TEMF) on Joint Base Lewis-McChord in Washington state – is shown at right and is a great example of this two-pronged daylighting strategy. The facility makes the most of the scarce upper Northwest daylight with Guardian 275® translucent wall panels in a clerestory configuration along each side wall, large ridge skylights running through the center of the facility, and smaller single slope skylights flanking the ridge skylights. The result? Even, soft, diffuse daylight that fills the space with natural light and cuts down on the need for artificial light sources. (Note that in the image above, no artificial lighting is on in the space.) It also makes the space feel open and welcoming – not-so-typical of a typical maintenance facility. Whether you need a simple wall system, a complex skylight, or a little of both, Major can help. Give us a call at 888-759-2678 or send us an email to find out more!